Good morning everyone. Today I thought I would bring you a little more Spring by showing you our Spring entryway. I wanted to keep it vintage and neutral this year and I think I achieved that with the items I chose. 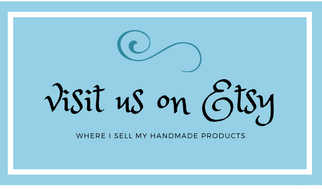 I basically just added a few more "vintage" items that I crafted to what was already there. As you can see I added the book page wreath that I made a few years ago. I love this wreath and thinks it makes such a statement wherever I hang it. It just fits so well in this space and adds to the vintage feel I am looking for. On the table itself I have a "vintage" clock sitting on a stack of old books sans covers tied with twine. Then I have a vintage lamp I found at a thrift store. I love the patina on this old lamp. In the center of the table are some cute little buckets with some Spring plants and a wooden bunny. 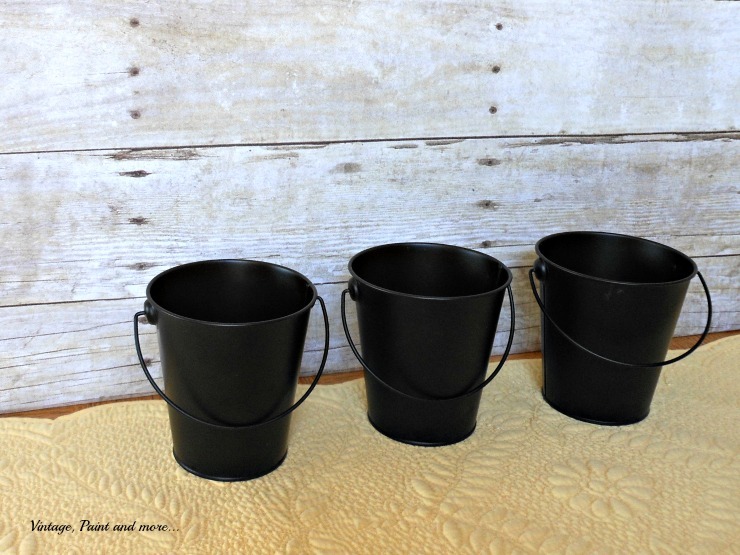 The buckets were a dollar store find that I picked up and decided to alter a bit. All I did was stencil a number on each one with a white paint pen and then added a small spring plant to each one. I also added a few sprigs of "faux" flowers to the middle one. So for very little I have a very trendy cute little touch of vintage Spring. On the bottom shelf of the table are two wire baskets I picked up at Hobby Lobby after Christmas. 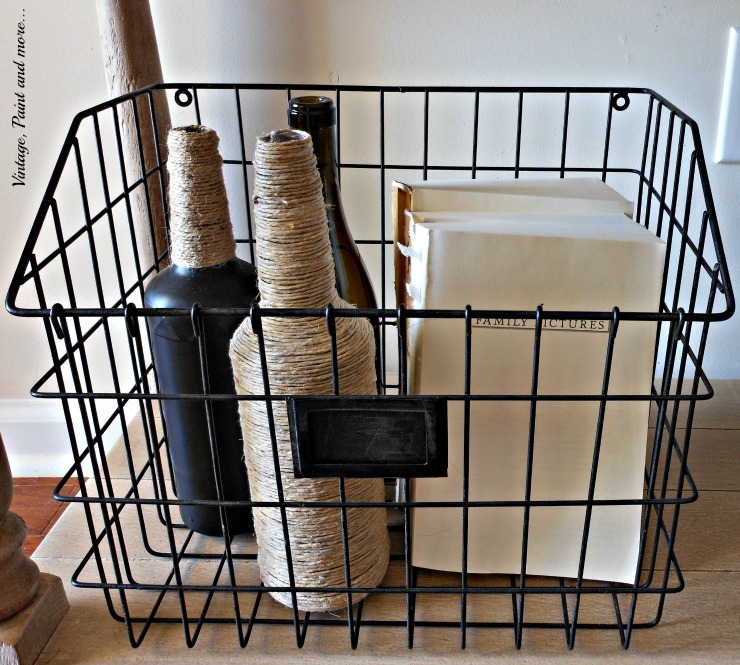 I am crushing on wire baskets right now and these are a perfect fit for this table. I filled them with crafted "vintage" finds. This one has some bottles that I either had or picked up at the thrift shop for $1. The front one I wrapped with twine ( if you follow me you know I love wrapping twine on all sorts of things). The left bottle is one that I painted with chalk paint and then wrapped the neck with twine. I had seen some of these at a craft store selling for $5.99 - $8.99 and knew I could make my own. So for $1 and paint and twine that were left over from other projects I got my own. The very back bottle is a brown one that I left as is. I also added some old books sans covers to this basket. The right basket is filled with books that I have covered with brown wrapping paper. I find this at Dollar Tree and always keep a roll on hand. It also comes with some printed designs ( of which I have several)- I used a flower design on one of the books. On the front book I also added a bit of French burlap ribbon to give it a little more vintage flair. 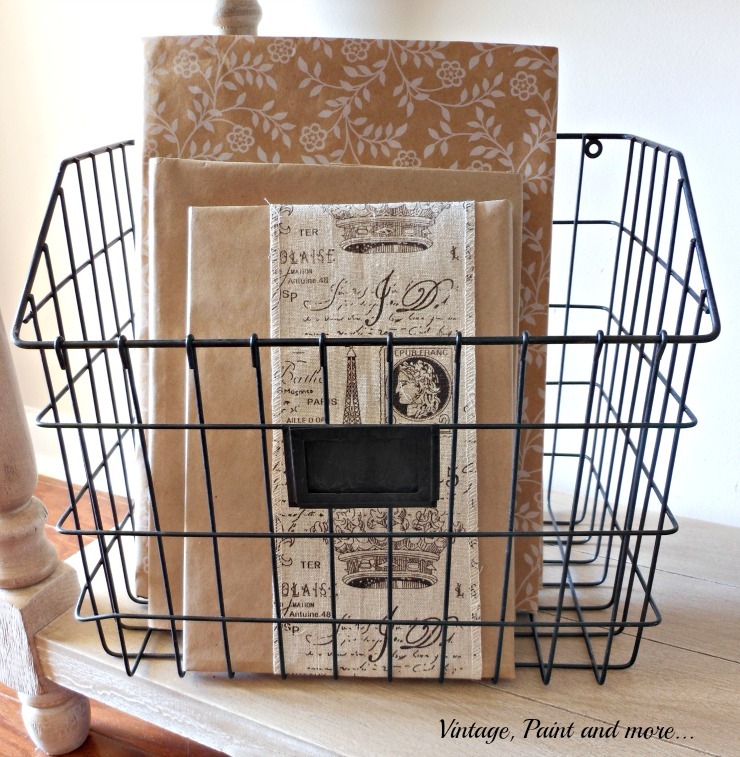 These are so simple to do and bring a vintage feel without spending a lot of money. I will be doing a tutorial on them later. I kept everything quite neutral so it wouldn't compete with the rest of the room. Just a bit of greenery and little yellow flowers. I have found my taste in decor is changing a bit lately as I have always been a white, cream and pastel gal with touches of shabby chic goodness. But lately I have been drawn to black and grey with browns and touches of metal and wire baskets. This is completely opposite of what I have done in the past but I am totally liking this new look. We shall see where it leads me. I may wind up with one room very pastel with shabby chic and one with very industrial vintage - the best of both worlds. So, have you begun your Spring decor? Are you changing it up a bit or a lot like me? Tell me all about it in the comments below. Don't forget to sign up for our emails so you don't miss a thing we share. You can do this in the Hello bar at the top. I will be linking up to the parties listed on the Where I Party page. 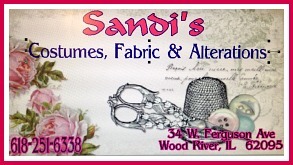 Be sure to go by and visit them and check out all the awesome creativeness and inspiration found there. 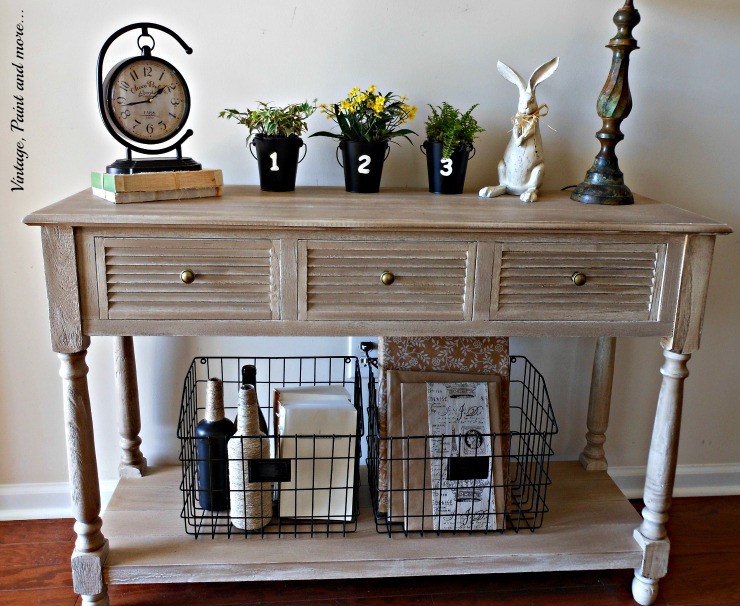 Your entryway is absolutely gorgeous...WELCOME SPRING! I love your neutral color scheme with just a hint of color. The bunny is sweet and those wire baskets are great! I am constantly changing in my tastes too, I think it just runs in our blood Cathy. I adore the cool crisp clean look of some modern, you've seen my house :p I also adore boho, comfy, colorful, cliché hanging beaded, feathery sillyness! I say run with it and see where it takes you. 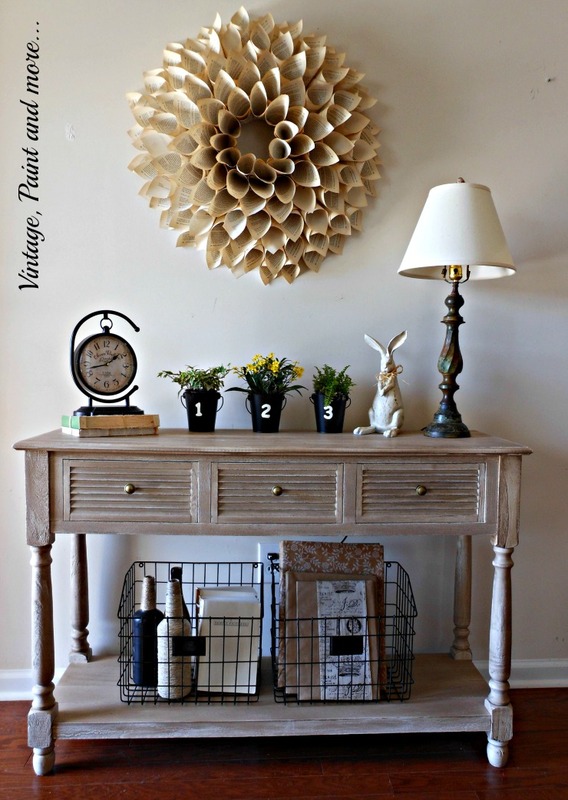 What a beautiful entry way vignette! I'm so partial to neutral themes, so I'm very drawn to this! I love how fresh, simple and classic this looks...just gorgeous! Pinning :)! How beautiful! Very inspiring, and I love the twine wrapped bottles. What a great vignette! I love the book page wreath. Neutrals are a great way to go in decorating. Looks classy. I have that same table. I got mine at Hobby Lobby and painted it green first and now it is off white. I added an old window to the back of mine to make it look more country. Have a wonderful weekend! No, I have not started my spring décor! And yours is lovely! All the things I love.....book page wreath, numbered pails, vintage clock...and that bunny is precious! 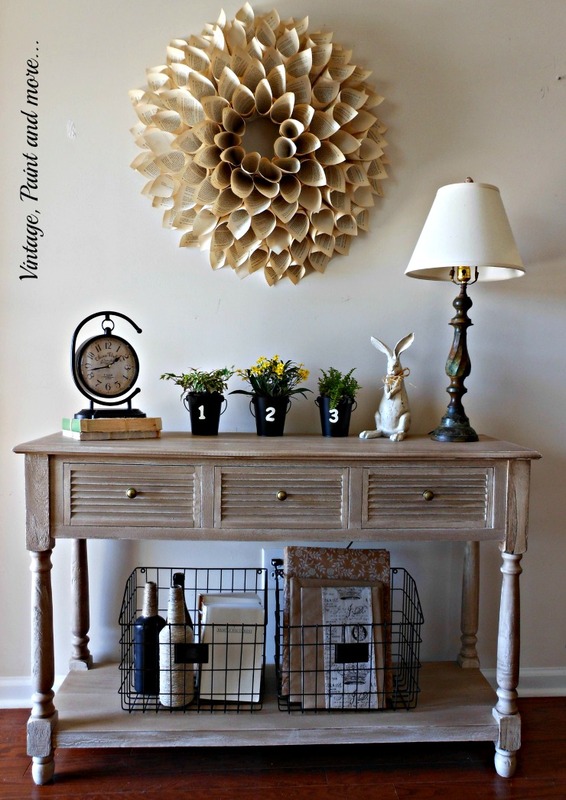 Oh, and wire baskets, too....You've got my mind racing with ideas for changing up my foyer table! Thanks! This is so lovely! 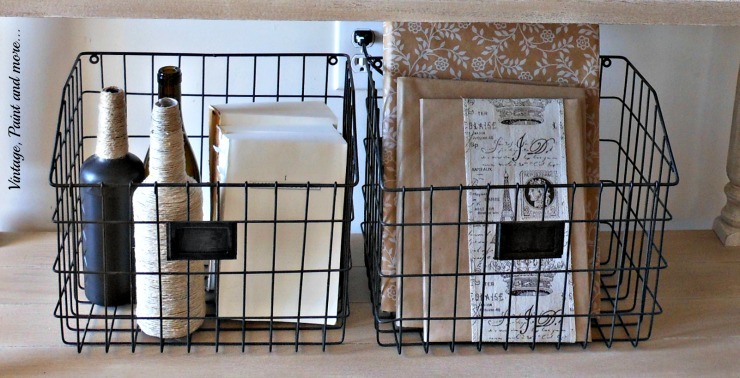 I love how you used neutral tones and the wire baskets are so great the way you used them. Thank you so much for partying with us at the Pretty Pintastic Party. Neutral and shades of white are my favorite decorating style presently. I love the whole vignette. what a beautiful vignette! love, love, love it! Your entryway looks amazing and is really pretty! I love the bottles and the books and the baskets and everything! I love these ideas! 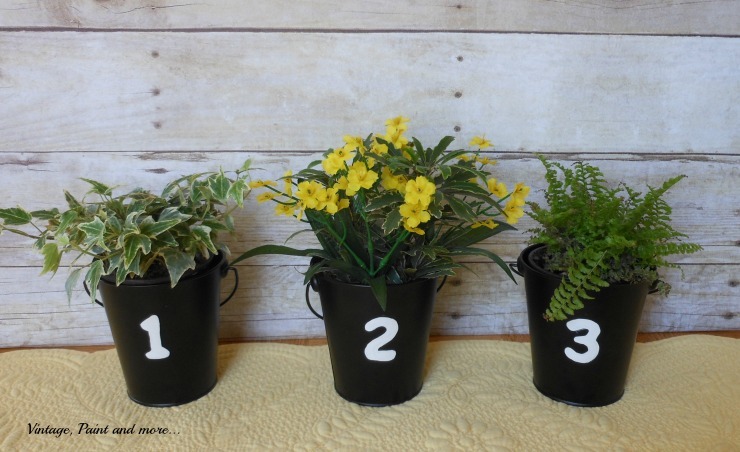 I especially liked the flower pots with the numbers, such a great idea! Thanks for sharing. Cathy - your Spring every way update is adorable. Your vignettes are so pretty. Thanks so much for linking up with Angie at Something To Talk About! I love everything about this! Thanks for the inspiration! Beautiful! I love your table! It's a beautiful and warm welcome, I love it! The added numbers really made a statement. Thanks for sharing with SYC. Beautiful Cathy! Thanks for joining HSH! Beautiful! Love how you styled your table! Thank you for sharing at Brag About It! Aw I love this. Has to be my favorite Spring entryway decor I've seen thus far!